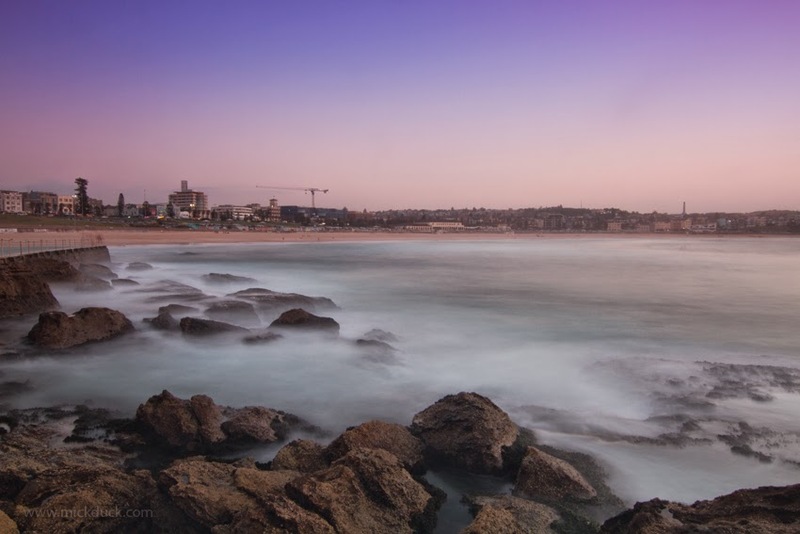 I wanted to try and get a different angle of Bondi shooting back towards the beach. I got up at my favourite time to be down at Bondi...sunrise! This time of the morning it is easy enough to get a park in the main carpark but to get to this spot it is a bit of a walk. I parked closer to Bondi Icebergs and walked down as I was lucky enough to snag a car park right there. I picked a morning where the tide was low at the same time as sunrise as i wanted to have the rocks behind the Icebergs Pool showing to create an interesting foreground. From the main Bondi Beach carpark you need to walk south towards Bondi Icebergs and go past the pool along the Bondi to Bronte walk. When you get past the pool if you come along the road you will then follow some steps down to where the path comes along from the walkway above the pool. Where these two path come together you can climb down onto the rocks from this point. Always be careful when walking on the rocks with the ocean. Never take your eye off what the ocean is doing. Canon 7D, Canon 16-35mm, Giotto's Tripod, Lee Filter Kit, Lee Little Stopper ND Filter, Lee 0.9 Soft Grad ND Filter, and camera trigger release. I had my camera set up on the tripod and before I put the filters into place I ensured that I had the composition and focus that I wanted using the camera in manual focus. The reason is that once the little stopper filter goes on it is very dark so quite hard to see through and the lens on autofocus can try and refocus after the filter is on. The settings that I used for this shot were with the camera in the manual settings so that I can control everything. I don't worry too much about the metering or white balance as I shoot in RAW and can adjust these in Lightroom or Photoshop Camera RAW after, but I generally shoot with spot metering and daylight white balance. The other main camera settings were f14, 25 seconds shutter speed, ISO 100. Whenever shooting long exposures it is best to use a remote trigger to ensure you don't get any camera shake.